Pundita: Applying the Bosnia Model to Syria. This is my nightmare. Applying the Bosnia Model to Syria. This is my nightmare. The think tank of the Pentagon wants to divide Syria according to the model of Bosnia. The result would be ethnic cleansing and new, massive flood of immigrants. The RAND Corporation, a leading US think tank close to the Pentagon, has published a report proposing a "Bosnian model" to resolve the Syrian conflict. The RAND Corporation calls for a decentralization of the country in control zones. The area from the west coast to Deir Ezzor with the exclusion of Rakka is to be controlled by the government in Damascus and the Russians. The area liberated by Turkey under Operation Euphrates Shield and the province of Idlib would be under Turkish control. The southern area of Daraa, on the border with Israel, would also be controlled by an "opposition" not described in detail by the RAND Corporation. A large part of Northern Syria would be controlled by the Syrian Democratic Forces (SDF), consisting of Kurdish militia and led by the US. It is particularly noteworthy that the RAND Corporation is proposing to place the ISIS strongholds and oil centers Rakka and Deir Ezzor under an "international administration." "We therefore recommend that the United States place the Rakka province, after its liberation, under an international transitional administration, creating a neutral territory that is not held by either the regime or the opposition until the final solution of the civil war." The area should be controlled by the UN, which in turn uses provincial councils. RAND Corporation, on the other hand, argues against sending a purely UN peacekeeping force to the international zone. Instead, the US and Russia would have to organize the deployment of a "coalition force," which is given a UN mandate. 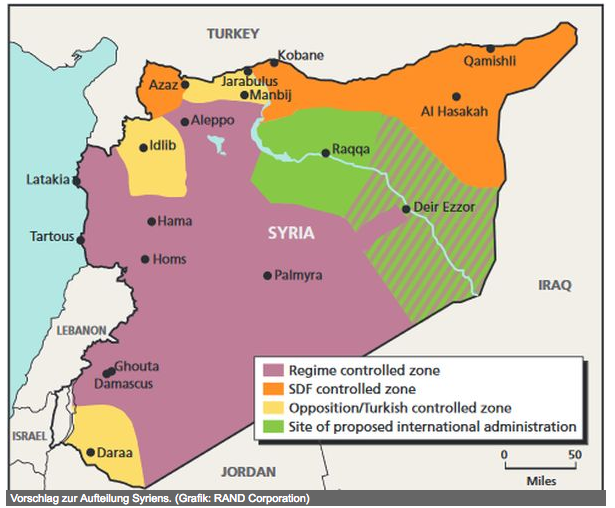 Such a solution would not only tolerate the US and Russia, but also Turkey and other regional US allies, which would not leave Rakka and Deir Ezzor either under the control of the ISIS terrorist militia or control by the Kurdish militia, according to RAND Corporation. On the Syrian map, it is noticeable that the city of Manbij is placed in the Turkish zone in northern Syria. The Turkish army has not yet taken Manbij, and the Kurdish militants of the YPG are against the city being occupied by the Turks. However, the Turkish President, Recep Tayyip Erdoğan, said at the beginning of the week that after the liberation of Al-Bab, Turkey would move to take Manbij. Last year, Manbij was taken by the Kurdish militia. There are currently numerous associations of the Kurdish militia in Manbij, but the majority of the population is Arab and Turkmen. The plans for the division of Syria are highly problematic: already in the Syrian war, massive ethnic cleansings have already taken place. These were carried out based on the planned petroleum pipelines. A territorial breakdown by ethnicity would greatly accelerate the trend towards expulsion. New escape movements would be the result. These would then come to Europe - which is desperately trying to shut itself off.